One of the things I hate about most gluten-free baking is that everything feels like eating chalk because it’s so dry and not all that nice. This cake is awesome, even Daz likes it and he normally hates all gluten-free stuff. 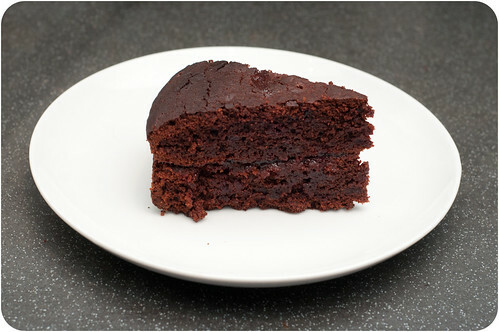 The beetroot might sound like an odd thing to put in a cake but it’s amazing and does something magical to create a lovely moist cake. Preheat oven to 180c and lightly butter a 20cm round cake tin (or two if you want to make a sandwich cake). Sift the cocoa, flour in a bowl. Mix in the sugar. Blend the beetroot in a food processor. Add the eggs, one at a time, oil and vanilla. Process until smooth. Make a well in the centre of the dry ingredients, add the wet mixture and lightly mix. Pour into cake tin and bake for 50-60mins or until a skewer inserted in the centre comes out clean. I used two tins so I could put a layer of jam in between two layers of cake. Yum! I made cupcakes using the same recipe and then vanilla and beetroot icing. 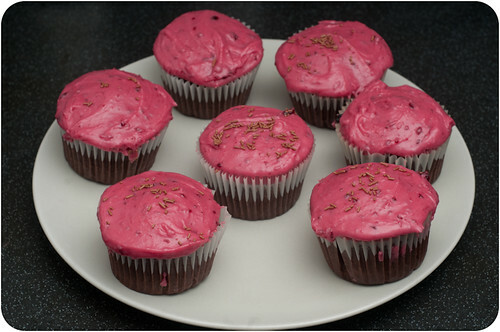 You only need a tiny bit of blended beetroot to make the icing bright pink. They’re yummy too.